A note to the University of Alberta – timing is everything | Watts Up With That? NPR finally gets it – does this signal an end to the polar bear as poster bear for global warming? (Edmonton) A University of Alberta polar bear researcher along with eleven international co-authors are urging governments to start planning for rapid Arctic ecosystem change to deal with a climate change catastrophe for the animals. U of A professor Andrew Derocher co-authored a policy perspective in the journal Conservation Letters urging governments with polar bear populations to accept that just one unexpected jump in Arctic warming trends could send some polar bear populations into a precipitous decline. The effects of climate change on polar bears are clear from both observational and modeling studies in many parts of the distribution. Earlier studies by Derocher and his colleagues show that one very bad ice year could leave hundreds of Hudson Bay polar bears stranded on land for an extended period. Derocher noted “Such an event could erase half of a population in a single year”. “The management options for northern communities like Churchill would range from doing nothing, to feeding the bears, moving them somewhere else or euthanizing them,” said Derocher. The concerned researchers say they’re not telling governments what to do. The authors, however, want policy makers and wildlife managers to start planning polar bear for both the predicted escalation of Arctic warming and for an off the charts worst case scenario. “You’re going to make better decisions if you have time to think about it in advance: it’s a no brainer,” said Derocher. Further, “consultation with northern residents takes time and the worst time to ask for input is during a crisis”. The researchers say the options for polar bear management include feeding and releasing the bears when freeze ups allow the animals to get to their hunting grounds. Derocher calls this a wild bear park model, but the paper reports the cost could run into the millions and could have ramifications for the long term behaviour of the animals. The authors of the paper say government should be aware of the fall-out from climate change and human safety in the north is going to be an increasing challenge.. The paper is titled; Rapid ecosystem change and polar bear conservation. It was published online as an accepted article January 25, 2013 in Conservation Letters. Models don’t cut it, data does. Polar bear numbers as estimated in 2009 by the Polar Bear Specialist Group of the IUCN Species Survival Commission: 20,000 – 25,000. Polar bear numbers as estimated in 2012 by the Polar Bear Specialist Group of the IUCN Species Survival Commission: 22,600 – 32,100. Ask the Experts: Are Polar Bear Populations Increasing? Some recent media reports have cited inaccurate data concerning polar bears. For clarification on polar bear numbers, we turned to Dr. Andrew Derocher, Chair of the IUCN/SSC Polar Bear Specialist Group. Dr. Derocher is a polar bear scientist with the University of Alberta in Edmonton, Canada. He also serves on PBI’s Scientific Advisory Council. If this is true, then why are scientists worried about population declines? Answer from Dr. Derocher: The various presentations of biased reporting ignore, or are ignorant of, the different reasons for changes in populations. If I thought that there were more bears now than 50 years ago and a reasonable basis to assume this would not change, then no worries. This is not the case. I can’t say this answer by Dr. Derocher inspires any confidence in his ability to give a straight answer. If it were guessing, show how that you determined it was “guessing”. These and other scientists agree that polar bear populations have, in all likelihood, increased in the past several decades, but not five-fold, and for reasons that have nothing to do with global warming. The Soviets, despite their horrendous environmental legacy on many issues, banned most polar bear hunting in 1956. Canada and the U.S. followed suit in the early 1970s — with limited exceptions for some native hunting, and permitted, highpriced trophy hunts. And a curtailment of some commercial seal hunting has sparked a seal population explosion – angering fishermen, but providing populations in eastern Canada and Greenland with plenty of polar bear chow, leading in turn to localized polar bear population growth in spite of the ice decline. The scientists also caution that we still don’t have a firm count on these mobile, remote, supremely camouflaged beasts. All this uncertainty over the numbers — past and present —even gave some conservative bloggers pause. I’m from Alberta, and this study by Dr. Derocher is just embarrassing. Looks to me like they are trying to get some quick grant money in before it all goes up in smoke. Ok, how about all these concerned scientists ADOPT just one young polar bear and raise it to adulthood in their own homes…..
That should fix the problem, after all the number of scientists concerned about polar bears would drop, and the polar bear population would rise, just what they want right ? New Motto; Hug (feed) a polar bear TODAY, save the Earth TOMORROW. And it would create lots of new jobs making polar bear toys and cleaning up scientist’s houses……..
Well he does have a book to try and sell…..
Then he does not know either……………..
…and an article from the Edmonton Journal, last July. “Polar bears, Derocher says, survived the last period of Arctic warming, but they did so at a time when there were no humans hunting them, no shipping, no oil and gas developments, and no pollution stressing them. The past period of warming was also not as intense or prolonged as this one is turning out to be. As I said in the NPR thread, the polar bear is NOT the canary in the coal mine…. He is an expert who has spent 20 years studying polar bears but even experts have biases. A good teacher and mammalogist by all accounts but maybe he hasn’t studied the geological record to figure out how polar bears survived previous ice free periods. Or maybe the current crop are bleached brown bears as someone said in another blog. 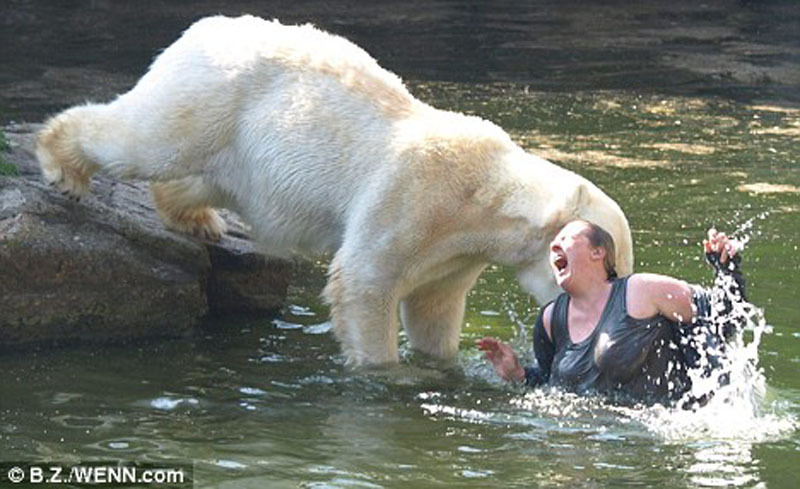 This German eco-woman wanted to interact with a cuddly Polar bear. Bad decision. And if you want a Polar bera, don’t raise it in your home! Tragedy could result. This is the only safe way to keep one in your house. Euthanize them? LOL, ya, that’s the ticket, kill them before they get a chance to die, thereby confirming the dangers of CAGW. /sarc. The University of Alberta is home to the laughable “Pembina Institute” which is a radical enviro group heavily funded by big Green. I guess they didn’t check your sea-ice page, Anthony. Hudson Bay is utterly frozen over. The 30%-and-greater sea-ice graph shows current levels are second highest since 2005. I’m in Saskatchewan and I’m embarrassed to be even this close to this guy. This is about the most incredibly myopic, navel gazing bull crap I’ve seen in a while. I personally know how top notch and rigorous grant proposals have to be to get funded in some branches of science these days. How, how how does this guy get any kind of funding at all? There have been numerous TV “science” programmes here in the UK over the past 2 or 3 years, all of which have included the “death spiral” story of Polar Bears. In every case, they have shown film of perfectly fat, healthy mother bears, each with usually 2 healthy cubs. They always miss the obvious connection that a female Polar Bear would be unlikely to be able to raise one cub, let alone two, if she was in any way short of food. Sir Richard III our beloved sovereign died from … from … ummm …. ummmmmmm … GLOBAL WARMING !!!!!!! There, now don’t we feel much better now my little possums. Before this scam took over there was a real bear biologist, name of Mitch ??? who was the polar bear biologist for NWT & Nunavut,he actually did field work, with real wild bears(as opposed to computer animated ones) and is well respected by the locals, apparently he would not speak the party line so the GNWT moved him on, last I heard he was advising Nunavut but he may have retired. But my computer said the bears would die. A considerably more reliable, verifiable – and dispassionate – source than activist/advocacy-tainted Derocher, can be found at Dr. Susan Crockford’s Polar Bear Science Past and Present. […] 16th meeting of the signatories to the Convention on International Trade in Endangered Species of Wild Fauna and Flora (CITES) in Bangkok Thailand (3-14 March, 2013) is a proposal to upgrade the polar bear from Appendix II to Appendix I status – prepared by the US Fish & Wildlife Service. The suggested change is based on what is claimed to be “a marked decline in the population size in the wild, which has been inferred or projected on the basis of a decrease in area of habitat and a decrease in quality of habitat.” If this proposition is adopted by CITES, it would be illegal to trade legally harvested polar bear parts of any kind. Advocate scientists would do more for polar bears of the future if they stopped their infernal cries of “Save the polar bear” and get on with the next conservation step – increasing our knowledge of this species. Where is the global campaign led by Stirling, Derocher and Amstrup for money to survey all Russian territories and East Greenland for polar bears? Why is all this advocacy effort being poured into more and more stringent regulation schemes and fighting the crystal-ball perils of global warming that may or may not be an issue 50 years from now when there are basic biological questions that still need to be answered – information critical to managing polar bear populations 10 years from now? Fortunately for Derocher, he doesn’t live in Churchill. That ‘could’ be dangerous. I may be a Canucklehead, but please, don’t insult my stupidity. A Polar Bear in every eco-dolt’s living room! Make it mandatory and watch the hilarity ensue. A great Canadian legendary band wrote a song about Dr. Derocher and his approach to research. “We want governments to be ready with conservation and management plans for polar bears,” says Derocher. And who is in the business of getting big bucks government contracts to come up with conservation and management plans for polar bears? Derocher, doing the old time elixir salesmen one better. At least their phony remedy was for what really did ail you. I worked in Venezuela for a while and I really enjoyed their Polar Beer. One of the best beers in the world. And I am a bit of an expert on that topic. Even if I say so myself. Dr. Derocher does not exactly have a stirling reputation among sceptics here in Alberta. The man has been bleating about the same thing for years. If you want some actual facts about the polar bears and the politics, read Dr. Susan Crockford blog. I wonder how Dr. Derocher knows about polar bears so much and their status if 7 subareas of the pole are listed as having ZERO bears. Perhaps the man should get away from the modeling school and check out eastern Greenland, the Barents, Kara and Laptev seas were, according to PBSG website, there are NO polar bears. I do suggest he take a guide with a gun and enough ammo. I guess I don’t see why the articles are so “funny”. They deal with the bear increases due to the ban on hunting and the possible decreases due to the anticipated loss of near shore ice, and they do it in a rather plain speaking manner, and don’t hide the complexity of the situation. Every five years for the last 30 we have a new record low ice record in the Arctic, and things don’t seem to be reversing up there. Bears mainly eat seals, and they go out on the ice to eat them. So they sort of need that ice stuff. That would be the Andrew Derocher who banned his former prof Dr. Mitchell Taylor from attending the 2009 meeting of the Polar Bear Specialty Group because of his non-endorsement of Anthropogenic Global Warming, as it was then known. What do they get on to get so far off the track! Isn’t soot (aka black carbon) reported to be a major culprit in the decline of seasonal ice? Do the Churchill tour buses . . .
. . . run on lithium batteries? Are ice-breakers environmentally friendly? Save the bears. Save the ice. Walk. Obviously we need huge slabs of super pykrete covered with artificial snow, made of alarmist newspapers, on an industrial scale all over the polar basin. That’s the only way to save the bears from the attacks of Nazi U-boats. I wonder how the Polar Bears in Russia are doing. The NE passage has been relatively ice free for the last few summers. If they can manage there then where is the problem? Send money and I’ll have a look at it. /s. Right on, Stuart – we should be embarrassed for allowing them to continue here unchallenged. I just hope the polar bears don’t read these columns about their forthcoming doom. Crikey they’ll need the likes of Lewandovsky and other trick cyclists to comfort them in their death throes! Its worse than they thought. Given that his basis for consider this will change is not reasonable either, I think its a little unfair . But then its clear that ‘science’ is playing second fiddle to advocacy , the bears merely being used to push a wider political agenda, so its hardly a surprise. Thanks for that. I needed a grin this morning. Didn’t a world expert on the Sea Bear get banned from a meeting (it may even have been Copenhagen) because of his usage of science (to point out what we are only now having proven to us) rather than advocacy? I have looked around but there is so much ‘churn’ in this subject that I cannot winnow the seed (the guy I am searching for) from the chaff (Derocher). I think this headline’s release is a left-wing think tank experiment to see how successful a lie can be under insurmountable contrary evidence. Like counting the guns at Rorke’s Drift. With the prospect of close to 100,000 polar bears by 2100, some level of concern might be in order. Derocher is not the only polar bear scientist available. All visual reports, ie. actual data, show numbers increasing even round Churchill where hunting is still permitted of troublesome animals who insist on returning to Churchill despite being taken many miles away. Probably the availability of food. Well if it was guessing in the 1950s was it guessing in 2009 and 2012? Just a few points about these highly vulnerable, doomed, cuddly creatures. How did Polar bears an ice free Arctic Ocean for a millennium or more? Before anyone pounces on me, I’m not saying Polar bears can survive without seals, just pointing out some of their survival strategies, even when the Arctic ocean was ice free during summers in the Holocene. Wow, that’s out of touch even with the inflatable reality of the MSM. Seriously though, nothing to laugh about here. It is one of our basic survival instincts in action: If It Worked Once Before, Try It Again. I had a friend who used to visit me once in a while during many years, and he was always accompanied by his dog. The very first time they came, the dog jumped out of their car and gave a chase to a bunny. She almost got it — came back with a tuft of fur stuck in her mouth. In the years to follow, every they time came to my house, she jumped out of the car and rushed to check out the same spot where she had nearly got that bunny. Did so even when she grew old and wise, and lame. Can’t do anything about the urge to check out that bunny. Call of nature. I think this professor is prematurely ramping up to the malleable beliefs being created in Alberta Schools in the name of 21st Century Learning and all children succeeding. https://docs.google.com/document/d/12zdzLuK6S3gcm44W1tylYkYRI3wiO2rai9VVwesX4sc/edit?hl=en_US#bookmark=id.ivfspwewhpo7 is what is called the Alberta Wheel of Competency. It actually comes from MS and is getting pushed all over the world now. In case any of the readers are wondering what exactly is going on in K-12. Because that vision will result in an adult who will not be questioning anyone’s modelling. Climate or economic. Wait a second folks, he’s right. at least one local population of polar bears could be in trouble. It all hinges on the definition of “unexpected”. If Churchill were to have the climate of Miami then I guarantee that the polar bear population around Churchill would be in trouble. Of course, the word “local” is also important here. The population around Churchill could go to zero while the overall population doubles. Churchill is pretty much the southern limit for polar bears. They are seldom seen just down the coast at Moosonee, for instance. It’s no surprise that that particular population is at risk. It’s also nothing, in and of itself, that we should be worrying about. This is an article I like to send around to family and friends regarding the unfortunate future of polar bears. The writer has had a journey similar to many of us here on WUWT. We were true believers until that “huh” moment. I think this might be his moment. “Polar Bears”, “Industrial Revolution”, and other CAGW terms have literally been hard wired into people’s heads over the last 25 years. It will take some serious transneural degeneration to rectify. Obviously, as in this case, some need more time than others. I guess you really can make this stuff up sometimes. Maybe we should stop using that phrase so much when discussing climate science alarmism. Yup, it’s the old “generate a grant” sausage machine, and if this particular meme wasn’t currently being deconstructed, they’d have had time to polish the turd. Hudson Bay, the hunting ground of the bears studied by the author, already melts completely in the summer. Does this kill off the local population of polar bears? No, they’ve adapted, evolutionarily, to the seasonal changes. What does logic teach us from that example? If I had to guess, I’d assume with total loss of summer sea ice (extremely unlikely), bears would do well because their favored prey would also come ashore more often, with no ability to enter hiding places from the water. This is just a logical presumption, and not an established fact, therefore is not an endorsement to anyone to panic on behalf of the seals. Give the guy a break. If he came out and said that the polar bear was not endangered, then he would lose all funding, and be out of a job. That is how the global warming people work. Everyone has to agree with them, OR ELSE! To become a savior, you first must convince others that something needs to be saved. So real death now is nothing compared to computer model based future forecast deaths. The no ice = no seals……so no bears relies on evolution being false. Need another forehead this thinking requires a double face palm. The bottom line here is that it is an apples and oranges issue. If Dr. Derocher had a new set of eye glasses, he’d see there isn’t a problem at all. Just another example of reporting to further a cause. Another one is banning assault rifles when they are the least used weapon of choice used by sick-os and criminals. Polar Bears appear to have survived multiple climate events over the last 120000 years. Why would they not continue to survive if, as the AGW protagonists would have us believe, the Arctic ice cap experiences another event? …This is just a logical presumption, and not an established fact, therefore is not an endorsement to anyone to panic on behalf of the seals. PANIC ON BEHALF OF THE SEALS! OMG I’m going to propose a study and apply for a grant immediately! PAAAAANIC!!! Time for the University of Alberta to fully investigate this “professor” to see if he has committed research fraud. And parents everywhere should think seriously about sending their kids to a University with research standards that support this type of activity. Unless of course the parents want their children to get a degree in Glowball Warming Fear Mongering and Hysteria from a second rate university. Derocher is apoplectic that Canadians in charge of listing threatened and endangered species have not embraced without question the recommendations of himself and the international Polar Bear Specialist Group, which he was chairman of between 2005 and 2009 (when the US uplisted their polar bears to “threatened” status). As Anthony says – timing is everything. Next month CITES meets to decide a US-led proposal (for the 2nd time) to get all trade in polar bears and polar bear parts banned and the US Fish and Wildlife Dept has been actively campaigning in Europe to get votes . I have a post that went up just yesterday on this issue at PolarBearScience: http://polarbearscience.com/2013/02/04/why-is-the-us-pushing-to-ban-polar-bear-trade-polar-bears-have-been-saved/ The Canadian gov’t has indicated it intends to vote against this proposal, which has no doubt made Derocher even angrier. Canada is also under pressure on another front because it has so far refused to go along with the US and raise its polar bears to a “threatened” status, leaving it as a species of “special concern. The Center for Biological Diversity has filed a petition with the international Commission for Environmental Cooperation demanding sanctions against Canada – a petition that uses all the arguments Derocher has used in the past. The deadline for Canada to respond was Jan. 23, 2013. I am watching to see if anything come of it. “The management options .. euthanizing them,” said Derocher. Quite a proposal. He is worried about global warming killing the bears – so we proposes we kill them to save them the agony of being killed. Tides Canada = US millionaires trying to dictate Canadian policy to the benefit of US interests. Derocher has tied his fame and fortune to arguing global warming is killing bears. To counter the Inuits claims that it is the time of the most bears, he and others have reported the Inuits were fooled because more bears were coming into towns because they were starving due to less ice. The Inuits argued the human interaction data was skewed by the city dump. Indeed the number of bears coming into town had risen with the greatest numbers in 2003. However after the dump was closed by 2005, the number of bears dropped precipitously to one half the average. However the advocates stop using any data after 2005. Derocher wrote a paper in 2012 and still used the data only up to 2004 before the dump closed. He also talks about the reduced condition of the bears, but again references old “zombie” data on body condition that stops at a 1999 paper. Unpublished data by Stirling and Lunn show that the bears body condition in the Hudson Bay had improved since then and by 2004 body condition was as good or better than the early 1980’s. These sins of omission border on scientific fraud. Derocher his trying to save his theory not the bears! Fred from Canuckistan says: Time for the University of Alberta to fully investigate this “professor” to see if he has committed research fraud. Not just Derocher, but Stirling, and the USGS’ Regehr. Regehr’s study of bears in the Beaufort Sea area, horribly abused the mark and recapture statistics. If they do not recapture a bear, then they must estimate survivorship by deducing the probability of the bear dying versus moving out of the study area and thus still alive but simply avoided capture. 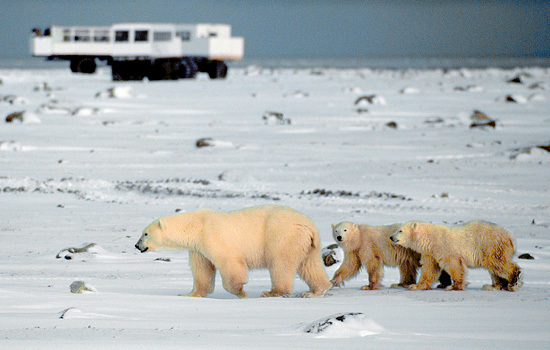 Because of the Arctic’s great variability, polar bears do not have territories like other bear species. Defending a territory only makes sense if food is reliable every year. Instead they are highly mobile. They have been shown to travel a distance that would be equal to traveling from the polar bear capital in Churchill to Dallas,Texas and back in a single year. So to constrain their estimates of survival, bears are equipped with radio collars. If just the data from collared bears were used the natural survival rate is around 98% and higher. Even though though most of the collared bears revealed they were outside the study area between 2004 and 2006 and thus less likely to be captured, Regehr simply treated them as dead and generated a dramatic drop in survivorship. Instead of using the collared data for their model, they used a drop in sea ice to “prove” less ice was “killing” the bears. That model predicted hundreds of bears had died, but no one ever saw any dead bears, until the story of the “drowning” bears emerged to support the model. The reason for the drowning was never known, but the only observation of bears actually drowning were caused when researchers drugged 2 bears that fell in the water and drowned. “Polar bears, Derocher says, survived the last period of Arctic warming, … The past period of warming was also not as intense or prolonged as this one is turning out to be. Nonsense. During the Holocene optimum 10 thousand years ago the Arctic was ice free for 1000 years and the polar bears survived. The polar bear is simply an ice adapted version of the grizzly (brown) bear. When there is no ice, polar bears eat the same food as grizzly bears. When the ice comes there is no food on land, so they hunt on the sea ice. Much easier to wait by an air hole in the ice for a seal than try and make a living catching mice. -The Baffin Bay area may have tripled from 1980’s estimates of 300 to 600 bears. However the Inuit challenged that low estimate. The new estimate in 2004 was increased to 2,074. However models based on estimated survival rates and reports of excessive harvesting of bears by Greenland hunters, the estimate has been lowered. Those models suggested the population may have now declined to 1600 bears, which is still 2 to 3 times greater than 1980’s estimates. -Only 333 bears were believed to inhabit the Gulf of Boothia in 1984 but they too quadrupled. Estimates of 900 were established in the 1990s and “following the completion of a mark-recapture inventory in spring 2000, the subpopulation was estimated to number 1,523 ± 285 bears [Taylor et al. 2009]. And the “WESTERN HUDSON BAY POLAR BEAR AERIAL SURVEY, 201” released in May 2012 show the Hudson Bay bears population is as high as it has ever been. The complete opposite of Stirling, Regehr and Derocher’s predictions. Polar bears evidently had no problem surviving the last interglacial, which also had an ice free arctic. And the “WESTERN HUDSON BAY POLAR BEAR AERIAL SURVEY, 201″ released in May 2012 show the Hudson Bay bears population is as high as it has ever been. The complete opposite of Stirling, Regehr and Derocher’s predictions. Climate Science. The art of predicting the opposite of what will actually happen. Paraphrasing from the author, Trevanian, I suspect that Dr Derocher’s studying is for one year–twenty times. One of my students did their weekly science article on this story yesterday, and when he was done with his presentation, I told him that actually, the bears are doing great up there, and directed him here. He shrugged, and I know that his take home message is going to be that the polar bears are still doomed. Teacher, thy name is Sisyphus. Incompetent hacks like Derocher aside, the U of A is hardly ‘second rate’…(it hosts very well regarded Engineering & Medicine faculties)…name a uni in Canada that isn’t polluted by activist leeches.The province is run by an ex-UN bureaucrat disguised as a conservative, therefore, any marquee institution like the U of A will perpeputate the ‘Cause’ because it guarantees more funding and willl help appease the eco-mentalists looking in. Considering the Alberta Government under Allison Red-Fraud’s ‘leadership’ spends 2-3 billion pumping CO2 into the ground it’s not much of a stretch to assume they will lap up all the rhetoric a few noisy fools spew out of the U. How painful it must be for Derocher, the Pembina Inst & all their ilk to reconcile the fact that the U of A is what it is today because of decades of huge oil & gas revenue in Alberta. A farmer in Iowa had a house broken into a time or two. The house was empty and on a parcel of farmland he bought. He anchored a gun inside with a rope leading to the door and the next crook that pulled the door open shot himself. Wasn’t killed however, so the “self-killing” part failed. The farmer was sued and had to pay – such setups are not legal most places. Coyotes and domestic dogs and so on have been killed in a similar manner with M-44 sodium cyanide ejectors. OK, this is relatively OT, but John Hultquist’s reference to M44 sodium cyanide ejectors brought this story to mind, which was represented to me as historical fact. Back in the ’70s in western Colorado the sheep ranchers were having major predator problems, primarily with coyotes. With no help forthcoming from the government, the ranchers took matters into their own hands by placing carrion-baited booby-traps with explosive cyanide ejectors, which raised a ruckus among the animal rights people, especially as coyotes weren’t the only animals attracted to the bait. A public meeting was called where all interested parties could explain their positions and perhaps reach an agreement. Though it was not in her district, U.S. Rep. Patricia Schroeder attended the meeting and as an elected official was given time at the microphone. “I understand why you ranchers are upset,” she began, “but you are approaching the problem the wrong way. What we need to do is to live-trap the coyotes and sterilize them and-” she paused as an old weatherbeaten rancher rose to his feet and cleared his throat. I wonder how Dr. Derocher knows about polar bears so much ….Perhaps the man should get away from the modeling school and check out eastern Greenland, the Barents, Kara and Laptev seas were, according to PBSG website, there are NO polar bears. I do suggest he take a guide with a gun and enough ammo. NAH, he should leave the gun and ammo home and just take a bunch of wide eyed, eco-nut grad students. That way he can help the seal population numbers. As part of the imploding of the GW hoax Eskimos (Inuit, if you’re European) are dealing with the rise in polar bear numbers by adapting an adage of Joshua Slocum. They hammer carpet tacks thru a sheet of plywood, and then nail that to some stout planks, leaving it outside their front door overnight: the bears run away, sorefooted. Slocum, you’ll remember, when plagued by Tierra del Fuegans (Injuns, if you’re American) in the Magellan Passage, scattered carpet tacks on his deck. He was wakened occasionally by a yell, followed by a splash. And his famous adage? Well, you’ll have guessed,: “A tack is the best form of defence”. Jordan, imagine you are a candidate for jury selection in a court (an instrument of skeptical inquiry) convened for the purpose of deciding this issue (polar bear population trends). During your examination as a potential juror you identify yourself as a former student of a scientist who will be called as an expert witness in the case. You express a pre-formed favorable opinion of his expertise and methodology, and admiringly confirm the ideological bias with which he approaches his research. You also characterize those who approach the scientist’s work with skepticism as childish amateurs. You have just disqualified yourself as a juror and as a favorable witness to the credibility of the expert. But you have qualified yourself as a potential “pal reviewer”. Congratulations!